“Flip it the other way, gently,” I’m directed as we sit on low cushioned stools in a coffee shop that is lined with burning embers for shisha in copper pots on the rug floor. Coffee silt drips into the saucer, like hyperactive sands of time, and I wait for my future to be revealed. This is the Turkish tradition of coffee fortune telling, and it is a part of every day life here. But this is modern day Turkey, so try as our Peregrine leader Suleyman may to interpret it, there’s also an app for that. Of course there is. She is called Gloria and she delivers a reading within a minute. You take photos of the ridges and rivulets of your coffee remains and she interprets it. According to the avatar of the app, Gloria says there’s a big purchase ahead for me. Gloria clearly wants me to bolster the Turkish economy. But we are, just by being here. Turkey was hit hard by a tourism downturn following the terrorist attacks of 2016. Travellers were deterred, naturally, and operators ceased or cut back their operations. Peregrine Adventures never left, and that’s why we’re here, to experience a country once again on the cusp of a resurgence. 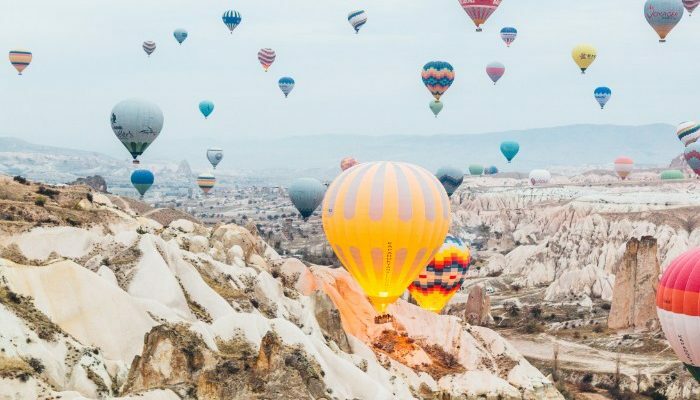 Turkey as a destination had the best growth across Peregrine in 2018. Istanbul is a city that captures the coffee reading experience in a nutshell – grounded in traditions and history, with a thick glossy veneer of modernity. You can visit the Old City, where spice merchants can’t let anyone pass without speaking to them. It’s the one place you’ll feel famous for no reason. The bazaars are some of the best places for banter. “Would you like to buy something you’ll never use again?” some sellers will joke. Then there’s the rolls of Turkish delight, thick and lustrous and not just rose-flavoured. Try marshmallow or Nutella flavoured. Or don’t try, the merchants will lure you in with slices and make sure you don’t leave empty-handed, just sticky-handed. We visit the Suleymaniye Mosque on Friday, the holy day for prayer. It is a welcoming place and we sit on the carpet and talk through the intricacies of the Islamic designs such as the chandeliers that hang low to allow the oil to be easily changed. “That’s the only lazy part of the design,” Peregrine leader Suleyman says. And there’s nothing lazy about this trip, as we veer off the tourist path. 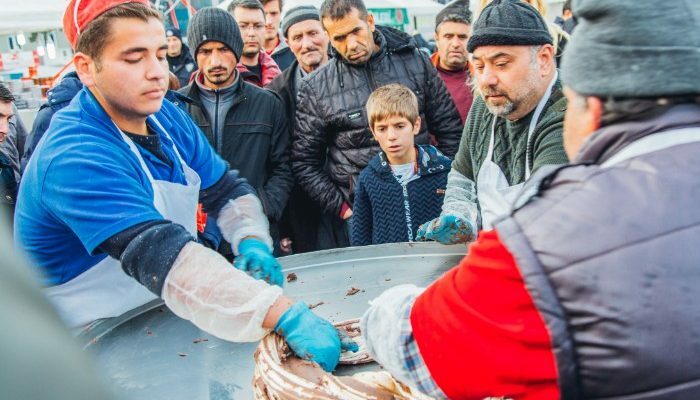 While tourism may have had a downturn, the ethos on this small group trip is to go to places only local knows – and in turn even impress the Istanbul locals with our travel plans. To the far northeast of the country are Kars and Ezurum. Both are connected by a train journey on the Dogu Express, to take advantage of low-impact travel and get amongst the local experience. And boy, is it local. Our group are the only westerners on the train. We sit in the dining cart and the rail staff eschew the food on sale for homemade soup they prepared earlier. Seeing our curious looks, they invite and welcome us to join them in Turkish, which Suleyman interprets. Bread is broken and much slurping ensues. The history to the northeast of the country is rich. It has a Silk Road lineage that means you’ll find beautiful Ottoman architecture in the middle of the city. 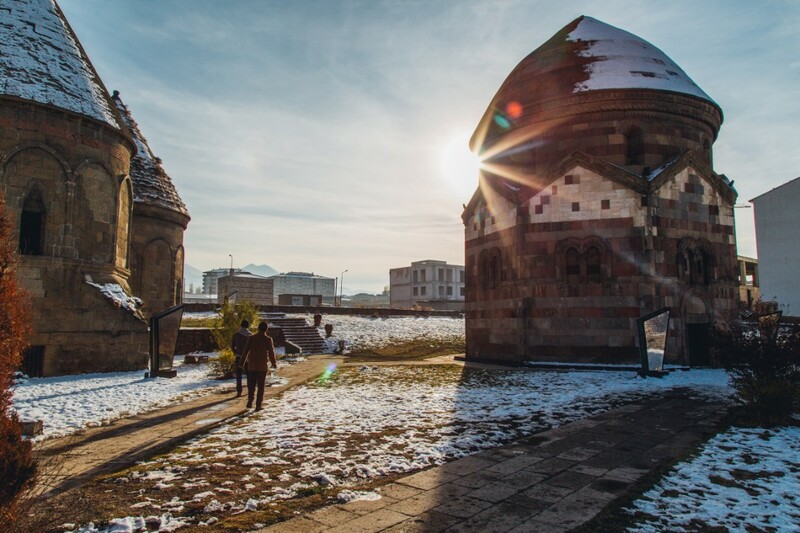 Just outside Kars is the historic site of Ani. Again, we are the only westerners present. It may be popular among local Turkish visitors, but it remains largely unexplored by travellers from abroad. The historic site is spectacular, granted UNESCO heritage status but two years ago. Ruins are remarkably intact, and tell a story of conquest and defence. Located high on a hill, with mountains of snow on the horizon, you can imagine how the tens of thousands of city dwellers stayed vigilant against invaders and marauders. There’s another reason we’re here in winter – to spread the tourist dollar further. 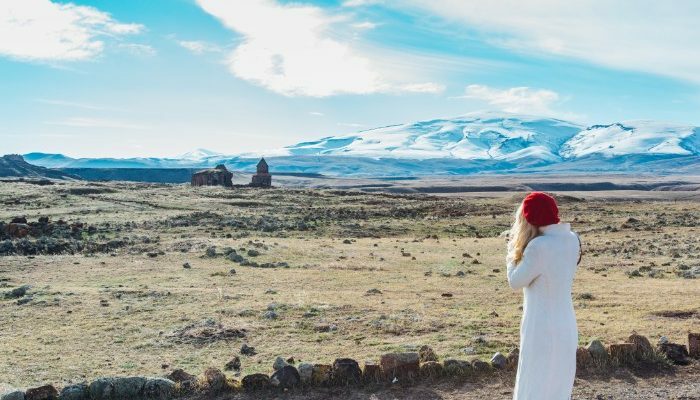 Turkey is still a seasonal destination, and to offset the impact of silo seasons as well as overtourism, winter is a great time to experience the remote areas. Cappadocia would have to be one of the most popular attractions in Turkey. But you appreciate other travellers during winter. First of all, there are less of them. Second of all, when you take a dawn hot air balloon ride to the skies, and see hundreds of others doing the same, like flickering fireflies, you appreciate the spectacle that other travellers create through their tourism. Another bonus of winter? Sunrise is later, so it’s a 6am wake up in Cappadocia for the balloon ride, as opposed to a 4am one in summer. After the early morning glory of seeing Cappadocia gently from the air, it’s time for some strong Turkish coffee. We also discover one more tradition around coffee. When you are engaged, as leader Suleyman became, just two days before our trip, you must visit your bride-to-be’s family. The fiancé will prepare coffee for everyone, including sugar. But the husband-to-be gets salt in his. The skill is to pretend that the coffee tastes great, even if you want to retch. “It says to the family and to your future wife that you will be with them through difficult times. Of course, it depends on the mercy of your girlfriend,” Suleyman says. Mercy could come from the jewels that we saw in the Grand Bazaar of Istanbul on the last day. Myself and a fellow traveller track down a jeweller through the labyrinth that was recommended by a friend. The jeweller immediately welcomes us and treats us like family, offering us apple tea from the tea sellers that service the Bazaar, and have approximately twenty phones to field calls from the different stores. There’s a ruby and sapphire necklace that definitely has my name on it at very hefty friend discount of half price. Is this the purchase that Gloria predicted? It may well be, but I decide to defy my fortune. Turkey is the kind of destination where twists and turns are unforeseeable, and each day is a surprise, so let go of any expectations of what the day will bring. The coffee may not have guaranteed my fortune or that necklace, but according to Turkish tradition, it guarantees 40 years of friendship. And that’s the one prophecy that will be true after the friendships forged over a week with our small group in Turkey. Do you want to experience the magic of Turkey for yourself? Join one of Peregrine’s small group tours in Turkey and you’ll experience things that other tourists won’t. So. There was this one time when I took a job as a travel writer and spent my first week in said job not at the office, but on assignment in beach shacks in New Caledonia. Have I looked back? That would be a no.